The big welcomed surprise from the State of the State was the announcement that the High Speed Rail project would be modified. Though it’s not exactly what skeptics had hoped for, it’s a step in the right direction. But, stay tuned, as I don’t want this project to drip on forever. Gov. Newsom also touched upon many of my five concerns (see MOORLACH UPDATE — 2019 State of the State — February 12, 2019). The Governor is also renewing the saber-rattling with the White House. I worried two years ago that this activity, then largely by the Democratic leaders in the Senate, may be harmful to California’s counties and cities, as they receive the lion’s share of Federal funding (see MOORLACH UPDATE — Eric Holder — January 5, 2017). The San Francisco Chronicle highlights Gov. Newsom’s jousting in the piece below. As always, I’m more about leadership versus showmanship and would prefer that Gavin pick up on the beginnings of a relationship, when he and President Trump toured Paradise and Santa Monica after their tragic fires. We are "one nation . . . indivisible," and the Governor should be working with D.C. in a collaborative and productive manner. 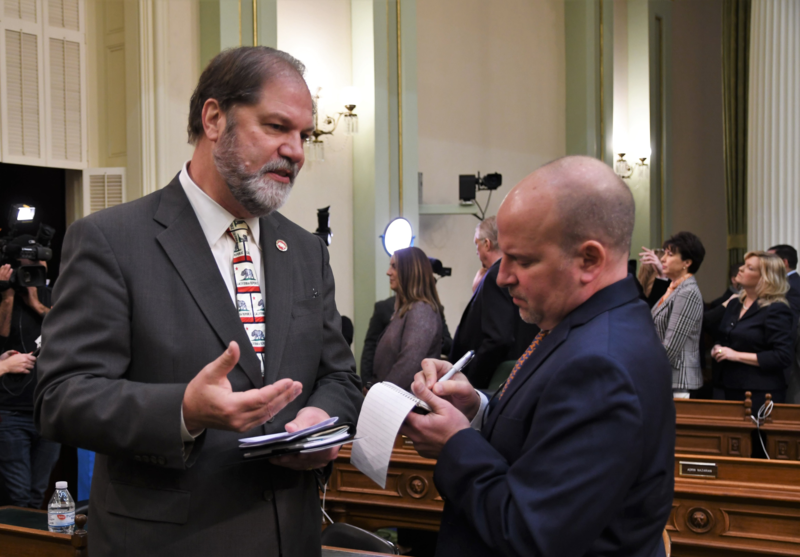 After the State of the State, I was interviewed on the Assembly Floor. On February 7th, 1994, at 10 a.m., on a very rainy morning, I held a press conference to announce my candidacy for Orange County Treasurer-Tax Collector in my firm’s conference room. Only one reporter attended, Valerie Haynes of then News Channel 3 for the Costa Mesa Cable News Station. "It’s one thing to announce that we need to ‘open the hood and fix the problem.’ It’s another to send in a qualified mechanic. It’s also dangerous to rely on the old cliche ‘that if it isn’t broken, don’t fix it.’ How do we know it isn’t broken? Who is keeping the incumbent accountable? What if he is running his ‘investments’ beyond the motor’s ‘red line’ month after month? Then who is to say we are not headed for problems?" The next day, the Daily Pilot’s headline read "Costa Mesa’s Moorlach to run for county position — Republican Party activist will seek treasurer-tax assessor (sic) office instead of council or Assembly post." It was written by Russ Loar. (Position titles were difficult even back then.) I was realistic about my chances, but I certainly missed the mark on the amount of media coverage the campaign would actually receive. I thought it would be two articles, Moorlach announces and Moorlach lost. Moorlach . . . says he expects it will be tough to unseat an incumbent in a political race unlikely to generate much media coverage. The LA Times had the following piece by Jodi Wilgoren, "Citron to Face 1st Challenger in 23 Years — Politics: Costa Mesa accountant calls the incumbent county treasurer-tax collector a bureaucracy ‘lifer.’" The incumbent had held the seat since 1970. "I’d like to have some new blood in there. I just want to provide some professional skepticism, do some digging," said Moorlach. "I want to provide a fresh face and give the voters a real chance at term limits." SACRAMENTO — Just five weeks into the job, Gov. Gavin Newsom has crystallized his vision of what California will look like in the Trump era: It won’t just be the hub of the resistance against the president; it will be its own nation-state. But before Newsom can create a country-within-a-country, he had to defuse two multibillion-dollar grenades that his predecessor, Gov. Jerry Brown, left in his in-box: high-speed rail and the delta tunnels project. In proposing Tuesday to scale back both of Brown’s unpopular legacy projects, Newsom hopes he can preserve enough political capital to get his own legacy projects on the fast track. If he can do that, he can lead California down its own path for as long as Trump is president. California must go it alone, because Trump’s portrait of America is “fundamentally at odds with California values,” the governor said Tuesday in his first State of the State speech. So California, as the world’s fifth-largest economy, is going to be a counterweight, a West Coast enclave built on its own values and funded, in part, by an anticipated $21.6 billion surplus. So while the White House is “laser-focused on destroying the Affordable Care Act,” as Newsom said Tuesday, he proposes that California offer its own health-insurance subsidies to families earning up to $150,000. He wants to expand Medi-Cal coverage to all Californians, including undocumented immigrants, until they are 26. To counter what Newsom characterized as a “so-called emergency” at the nation’s southern border, he said Monday that California will remove its National Guard troops stationed there and redeploy them to take care of state issues like wildfire protection and the eradication of illegal cannabis farms. Newsom even appointed California’s own surgeon general — Nadine Burke Harris, a pediatrician who is the chief executive of the Center for Youth Wellness in San Francisco. Newsom has already proposed that California extend paid family leave and offer universal preschool and free community college to help low-income residents, since little is being done in Washington to address wealth inequality. State Sen. Scott Wiener, D-San Francisco, said California has little choice but to act on its own. But even Newsom realizes he can’t go it entirely alone. In scaling back high-speed rail to a Central Valley-only project for the foreseeable future, the governor nodded to the $3.5 billion that Washington has allocated for the train line so far. He could have added that far more money from the federal government will be needed if the state ever tries to build out the line that voters envisioned when they agreed to pay for high-speed rail in 2008. And Congress has yet to approve $9 billion that California needs to recover from two years of devastating wildfires. Newsom has taken pains not to antagonize Trump on the subject, passing up an opportunity to needle the president when he suggested that the state’s forests would be much safer if they were only raked regularly. Last week, Trump tweeted his appreciation for how “nice” Newsom had been to him. Orange County Republican state Sen. John Moorlach worries about the California vs. Trump battle getting too personal. While Newsom is creating task forces and commissions to deal with everything from privacy issues to homelessness, Moorlach said, “We should be doing the same with D.C. How do we work together collaboratively to get things done instead of just shooting statements back and forth?